If setting up music speakers in every room of your house sounds like an expensive, time-consuming chore, well … you’re right, especially if you wanted to be able to play one song in the living room and another in the kitchen. The new Play:3 music system from the audio gurus at Sonos doesn’t quite solve the expensive part of the equation, with its wireless bookshelf speakers going for a pricey $299 a pop. But they’re incredible easy to set up, requiring little more than nearby power outlets, a compact $50 wireless “Bridge” that connects to your home broadband network, and about a half-hour of your time. Oh—and the speakers sound good, too. 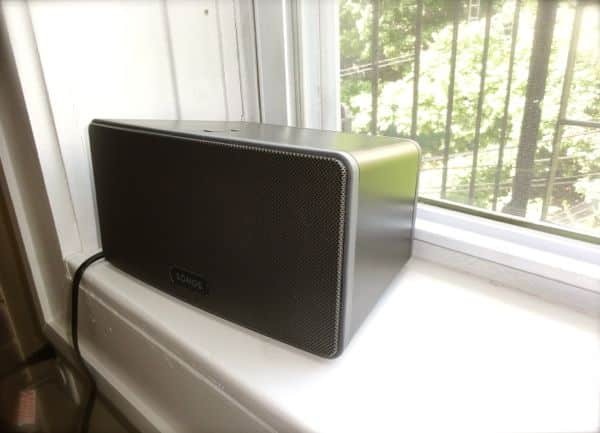 Sonos sent me a test pair of Play:3 speakers and a “Bridge” device earlier this week, and I was literally playing wireless tunes in two different rooms within twenty minutes. Just connect the Sonos Bridge to your home Wi-Fi router with the included Ethernet cable, and you're halfway there. Here’s how it works. First, you plug the Bridge into a power outlet and connect it to your home Wi-Fi router using the included Ethernet cable—a process that takes all of 30 seconds. You then take your Play:3 speakers (maybe just one, or a pair, or as many as your budget allows) and put them into the rooms you’d like to fill with music. In my case, I put one Play:3 speaker on a table in my living room, while the second speaker fit nicely on a windowsill in the bedroom. Once I plugged them in, their respective indicator lights began to flash, signaling that they were ready for a wireless connection. Next, you install and run the Sonos controller software on you PC or Mac. 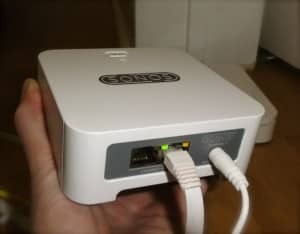 An installation disc is included in the box; at this time, unfortunately, the Sonos software doesn’t support “Lion,” the new version of the Mac operating system. Once launched, the software asks you to press a button on the Bridge to connect it to Sonos’s custom wireless audio network; you then follow the same, easy-as-pie procedure for each of your Play:3 speakers, which the Sonos program individually labels for you depending on the room (living room, dining room, kitchen, and so on). You can control the Play:3 speakers using apps for Android phones, the iPhone, or iPad (pictured here). All set? After the relatively painless setup process, the Sonos software scans the music on your PC or Mac (yes, your iTunes library is supported). 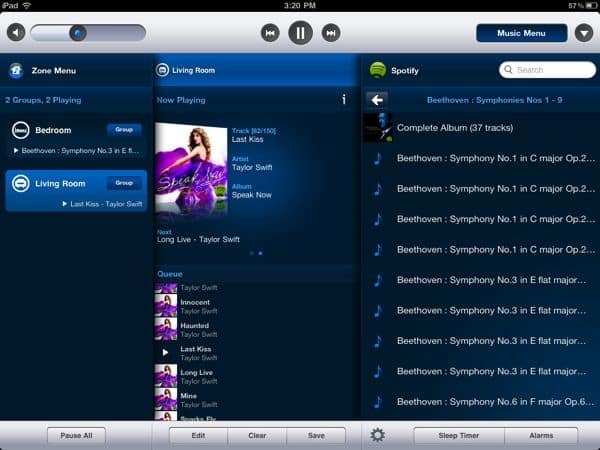 You can also set up local and Internet radio stations, or sign into an online music account like Pandora, Last.fm, Spotify (provided you’re signed up for the $9.99 “Premium” subscription), Napster, or Rhapsody. And then … well, you’re ready to start playing music, which you can control using either the PC/Mac desktop software, or apps for the iPhone, iPad, or Android phones. Both the apps and the desktop software let you control individual music queues for each speaker, meaning your can play a mix of country tunes on the Play:3 speaker in the kitchen, plus a Bruce Springsteen compilation on the Play:3 in your living room—simultaneously, mind you. You can also group separate Play:3 speakers together, creating what home-audio experts like to call a music “zone.” For example: if you had four Play:3 speakers, you could group the speakers in your living and dining rooms into one music “zone,” while the speakers in the bedroom and home office could be grouped into a second zone. You can mix and match your Play:3 speaker "zones" however you like; I put one of the speakers in my living room, another in the bedroom. 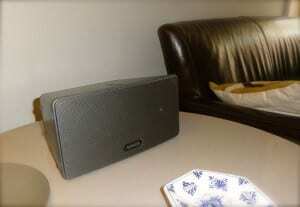 Last but not least, you can group two monaural Play:3 speakers in the same room into a stereo pair. OK, but how do the Play:3 speakers sound? I’m no audiophile, I’ll admit, but I thought they sounded pretty impressive—warm, clear, and deep, if lacking the crystal-clear sound you’d expect from a wired, high-end bookshelf speaker. Beethoven’s Third Symphony sounded just OK to me on a single Play:3 speaker, but I thought Taylor Swift’s “Haunted” sounded punchy and dynamic—and yes, you can certainly crank the volume if you wish. Very nice, but make no mistake—Sonos’s Play:3 system isn’t cheap. For two speakers plus the Sonos “Bridge,” you’re looking at about $650 and change. That said, you’ll be hard pressed to find an easier way to wire—er, unwire—your house for music. Note: Sonos sent me a pair of Play:3 speakers and the Bridge connector for review purposes; I’ll be sending them back once I’ve finished reviewing them.